Tejay Van Garderen is set to join EF Education First for the 2019 season. The rider will be an addition for the team for his climbing and time trialling skills. The American puts an end to his time in BMC Racing Team, where he was since 2012, and is excited about this new episode of his life. "I’m looking forward to being a part of 'America's’ team,'" said the rider. "I’m certainly not a young rider anymore, but I’m still way too young to be put out to pasture. "I’ve had some good results, some ups and downs, and I’m still interested in exploring the capacity of what I have to give, however that translates. Whether it’s helping a teammate or grabbing results for myself. Whether it’s grand tours or one-week stage races. I still think there’s a lot more I can offer." Van Garderen thanks BMC for his years there and now is ready for what is coming in his career. "I’m definitely going to look back on my years on BMC positively," the American explained. "I’ve accomplished a lot with that team. But at a certain point sometimes you just need a fresh environment, fresh faces, some new ideas." 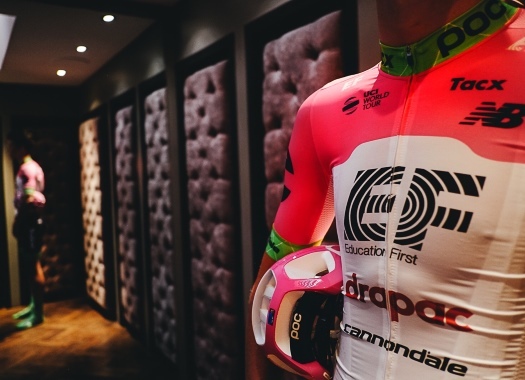 EF Education First's CEO Jonathan Vaughters is looking forward to working with Van Garderen once again, as he worked with him when he was a junior. "This is a new chapter. Maybe even a new book," he commented. "Tejay exhibited incredible potential in his younger years. He’s been riding under very high pressure for years as he was pegged as America’s next great cyclist. That’s been tough billing to live up to, and it would have been for anyone. I think we can get the best out of him using an approach that gets him back to thinking about bike racing as fun as opposed to shouldering the weight of being the next great hope in American cycling."